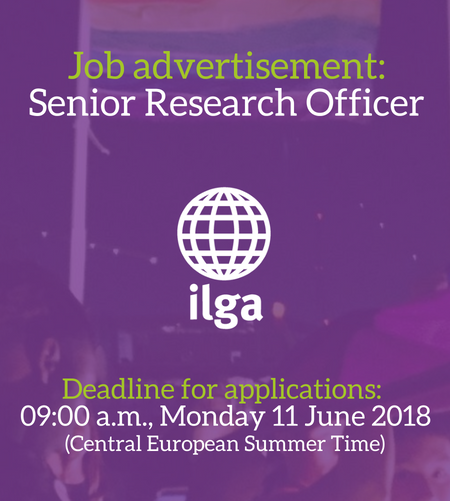 ILGA seeks a Senior Research Officer to head-up its world-renowned research work, based out of its Geneva office. Specifically, the position will take responsibility for two major streams of research: ILGA’s State-Sponsored Homophobia Report and the ILGA-RIWI Global Attitudes Survey. The position is one that has the potential to develop and grow over time, including possibly developing new streams of research. ILGA’s publications are in-depth, high quality products with a strong commitment to academic and professional integrity. The successful candidate will therefore be an accomplished researcher with a high level of attention to detail and accuracy, and able to independently conduct and oversee complex research projects with varying methodologies. The researcher will have a knowledge of international human rights law and a deep awareness of the nuances and community developments in language and concepts relating to SOGIESC. Strong awareness around gender issues and a knowledge of LGBTI movement dynamics is an asset as is experience in culturally-appropriate, community-based or community-led research. The closing date for applications is 09.00am, Monday, 11th June (Central European Summer Time).